Today, at the International Society for Technology in Education (ISTE) 2018 conference in Chicago, we’re pleased to introduce Global Problem Solvers: The Series (GPS: The Series), a new Cisco corporate social responsibility (CSR) educational initiative. The new animated series and supporting activities for middle schoolers are available at no cost in English, Spanish, Hindi, and French at www.gpstheseries.com. GPS: The Series engages students with a team of teens from around the globe who use technology to solve real-world problems. The mission of the series is to inspire students to become global problems solvers — global citizens ready to thrive in an increasingly connected and digital future by thinking like entrepreneurs, innovating like technologists, and acting as social change agents. For more than two decades, Cisco has built an award-winning IT training program in the Cisco Networking Academy that has prepared millions around the world for careers in technology and supported educational nonprofits that foster STEM skills development for students of all ages. On the heels of NetAcad’s 20th anniversary, we’re looking now to middle schools with a new signature program that will inspire the next generation to embrace the power and potential of technology and social entrepreneurship to transform lives. Today’s digital natives are tomorrow’s business leaders and workers; starting a pathway for increasingly in-demand entrepreneurial and life skills development earlier benefits everybody. That’s why GPS: The Series targets students during a critical inflection point in adolescent development and STEM adoption, especially for girls, and further aims to demystify and understand the potential of IoT to be harnessed for social good. The animated characters in GPS: The Series — and students working with the program — focus on social, economic, and environmental problems around the world. In the first season, they give a village access to clean water in Malawi, and in the second, they figure out how kids can continue learning when schools are closed after a hurricane hits the U.S. Gulf Coast. GPS: The Series helps educators introduce students to important skills that are increasingly relevant in a digital workplace and world. This includes complex problem solving, critical thinking, creativity, people management, and coordinating with others while emphasizing social consciousness, entrepreneurship, and the potential of technology to accelerate impact. By approaching social change as an entrepreneur, and applying technology to accelerate the difference they can make, students learn to find solutions that not only bring about real change but are scalable and sustainable. 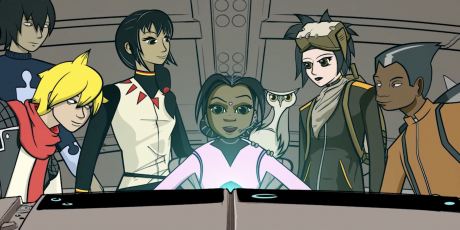 As technology rapidly changes the way we way we live, work, play, and learn, we hope tools like GPS: The Series will prepare a new generation to survive and thrive in our increasingly interconnected and digital world. We encourage you to explore the site at www.gpstheseries.com. Share it with your children or schools in your community. We look forward to your feedback and to the impact the Series will have now and hopefully for years to come.